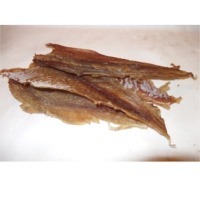 Dried Codfish by Baltic Dried Fish. Supplier from Lithuania. Product Id 893919. Dried and salted cod, sometimes referred to simply as salt cod, is cod which has been preserved by drying after salting. The fish is beheaded and eviscerated. It is then salted and dried ashore. Traditionally the fish was sun-dried on rocks or wooden frames, but today it is mainly dried indoors by electrical heating. Search More Like "Dried Codfish"